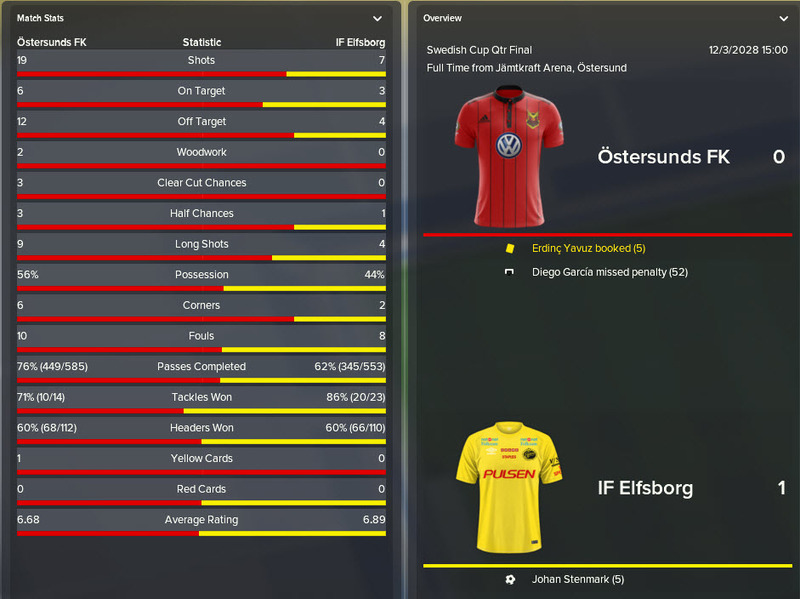 I’m really into this save with Ostersund and I can safely say I have never had a save quite like it. Before blogging about Football Manager I would rarely stick with the same club past 6 seasons and when I did it was with the team I support. Since I began blogging, I am certainly more committed to each and every save I play. Last year I wrote 50 posts in VivaGlobetrotting – I started with Deportes Puerto Montt in Chile and ended with Celta Vigo in the mid-2030’s. This year, I am a one-man team: Ostersunds FK. 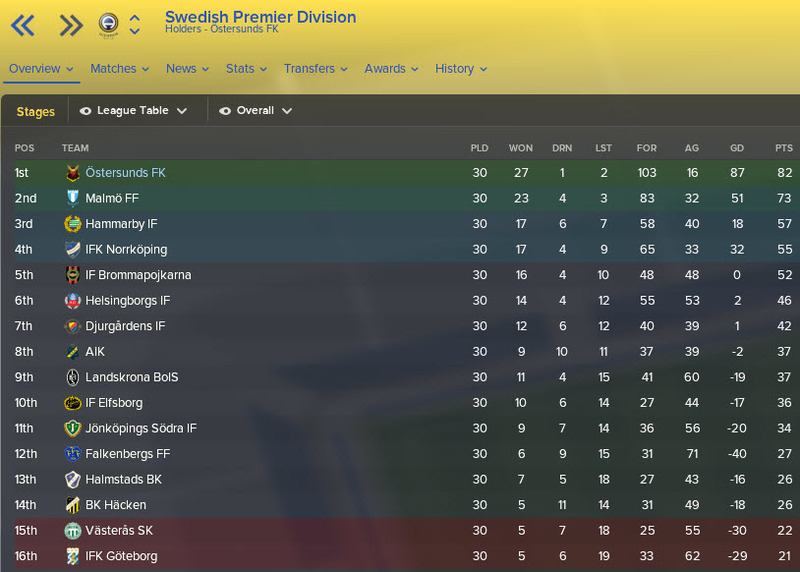 We have now gone through twelve seasons in Sweden and it is easily the most engaged I have been in a Football Manager game to date. What is your favourite ever save on FM? Tell me about it in the comments section! Let’s see how Ostersund have done in season 12. If you missed what happened in season eleven go back and read it here. 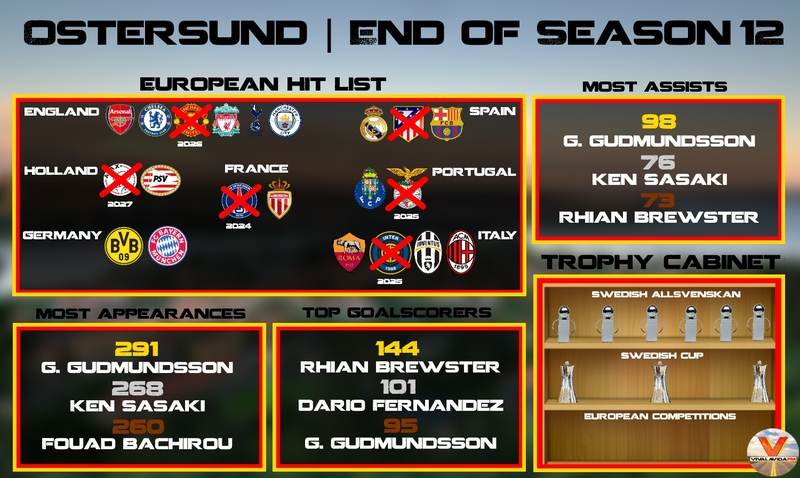 Season 12 has really redefined how Ostersund operate in the transfer market. It was a fairly innocuous winter transfer window with only a few players leaving or joining the club but it was in the summer of 2028 where things really started to heat up. Let’s take a look at our outgoing players first. Midway through the 2028 season comes the summer transfer window. Quite often this is where we see a lot of our talent receive interest from abroad. This year saw two key midfielders, Igor Papuga and Diego Garcia, depart the club. Igor Papuga joined us in 2023 for £2.5M and went on to make 192 appearances for the club, scoring 35 goals and assisting 42. Chelsea came in for several bids in the range of £25-30M – we started our negotiation at £60M and reduced this by 1 million for each of their counter bids. They finally accepted £57M and Papuga departed for an Ostersund record sale! We used a similar negotiation tactic for Diego Garcia. The Chilean was wanted by several top European sides and Manchester City were the first to bid (£22M). We set our negotiation at £40M and ended up agreeing on £39.5M. Garcia made 120 appearances for the club and contributed to 44 goals in his time with us (20 goals and 24 assists). But it was time for him to move on with several younger players showing more quality in the AMC role. We signed more players than usual this season, but most of them are players with potential rather than first-team signings. Shown below are the players to be used heavily in the first-team this season. Emil Westerlund is a Swedish central defender who will be an important member of our defensive unit this season. He’ll likely rotate with Dmitrovic and Meckarovski but can expect a decent chunk of first-team football this season. Turkish striker Mehmet Guder comes in as a direct replacement for Ze Gomes. Although I liked having Ze Gomes, both he and Rhian Brewster are approaching their 30’s and I wanted to replace one of them with a younger and better striker going forward. Guder fits that bill perfectly and he is an exciting prospect to bring into the club. Here he is. Ostersund’s new record signing for a whopping £73M, Markus Eckmann. The 20-year-old German was signed after meeting his release clause as a replacement for Igor Papuga. I am confident that he can lead this club forward over the next ten years – an exciting time to be an Ostersunds FK fan! The Swedish Cup is the traditional season opener in Sweden and as always we would have expected to win it. We progressed through the group stage comfortably but inexplicably lost to Elfsborg in the Quarter-Final! Elfsborg scored an early goal through ex-Ostersund defender Johan Stenmark and held on for the win. Could this disappointing defeat with a new tactic (to be discussed in a future post) be something to worry about? Last season we progressed through to the Champions League knockouts after finishing in 2nd place behind Inter Milan and were drawn against Spanish side Sevilla. In the first leg vs Sevilla we dominated the game but couldn’t force a win – drawing 1-1. Their away goal could prove crucial as we would need to go away to Sevilla and score. And that we did, we scored two early goals that really settled the tie, though Sevilla did fight back to score a consolation goal. Ostersund progress through to the Champions League quarter-final for the first time. With teams like Manchester United, Juventus, Real Madrid and Barcelona all there to be drawn against, when West Ham were the team drawn to play us I couldn’t believe it. How could West Ham be in the Champions League quarter-finals?! Complacency knocked us out of the Champions League this year, not West Ham. A great 1-1 draw away from home meant that all we’d need to do is win at home to reach the CL semi-finals. But we failed to do so, going down 1-0. West Ham went on to face PSG in the SF’s where they lost 2-1 on aggregate. Having won four Swedish Allsvenskan’s in a row, surely a fifth is expected? Indeed it was, yet Malmo were the team to really push us this year. They won 13 of their opening 14 matches and led the league at that point. But it was our 22 matches won in a row that won us our fifth consecutive Allsvenskan title, our sixth overall. We lost two matches this season, and despite going unbeaten last season for me this season was a completely different story. Last year there were several games where we had to adapt our tactic to chase a late winner or equaliser. That rarely happened this year as we stormed to success in all but three matches. As mentioned before, I’ll be writing about my tactic soon to really highlight what I have changed and why it has worked. We carried our form from the league into the Champions League, winning five out of our six matches. Our group contained Atletico Madrid, Krasnodar and Ajax, a fairly easy draw considering some of the other potential opponents! As winners of the group we could expect an ‘easier’ opponent to face in the last 16, though Real Madrid finished second in their group so I guess there are no easy games in the CL knockouts! Inter Milan are a team we have beaten before but we certainly don’t have the better of them in our past encounters. 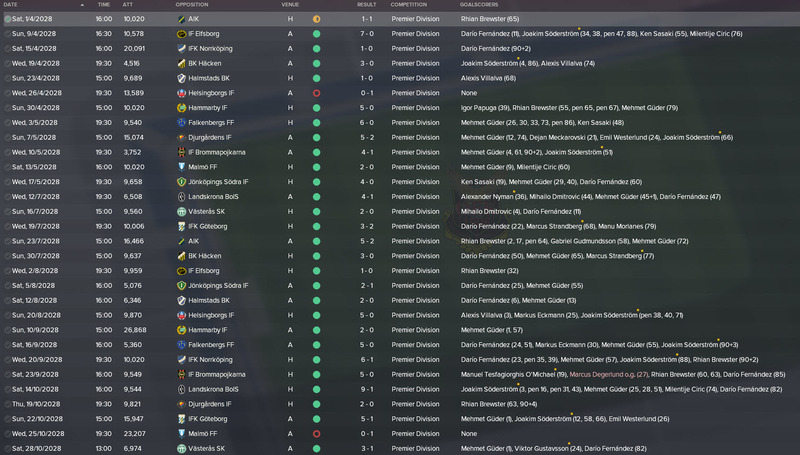 So far in this save we have played them 6 times, won once, drawn twice and lost three times. But we are an improved side now to the previous times we have played them so hopefully we can reach a second CL quarter-final. We are edging closer to a 70% win percentage with Ostersund, that would be truly remarkable. To add to this, Oscar Friberg is now considered an Ostersund legend! He sits alongside Graham Potter, Rhian Brewster and Dario Fernandez as true legends of the Swedish club. In beating Atletico Madrid we have crossed off another European giant from our hit list. As with other seasons in this save, I will be writing two extra posts to go alongside this season 12 review. I will be taking a look at one of our best regens (or newgens) to have come through our youth academy, Manuel Tesfagiorghis O’Michael. The Swedish right-back came through our academy as a 3-star current ability player with 5-star potential but he hasn’t got anywhere near that – I look to find out why not. The third post from this season will feature an analysis of the tactics I have used throughout this save and how we have evolved to match our playing squad and ambitions. Should be a fun post to write. I’m looking forward to sharing these with you! Thank you very much for reading another instalment of our Football Manager 2018 story here on VivaLaVidaFM. It is clear that we are building towards a Champions League push. What is your prediction for when we will finally win it?